South Asia has more than four times as many unreached people groups (3,406) as any other region of the world. On Monday, August 31,1964 at the home of Mr. and Mrs. Emmanuel Phillips, 6211 S. Dorchester, Chicago, IL, a meeting was called in which the Rev. W. C. Trotter presided. The purpose of the meeting was to organize a church. The invitation was extended for the reception of members. Those persons who joined were as follows: Mr. Emmanuel Phillips (1967); Mrs. Phoebe Phillips (1969); Mrs. Verdell Sharp (1969); Ms. Gwendolyn Ivy (1999); Mrs. Ruby Jenkins; Deacon Ivory Jenkins (2003); Mr. David Jenkins; Mrs. Mattie Sims; Ms. Patricia Jenkins; Mr. Chester Beam; Mr. Donald Jenkins (1988); Mr. Lionel Jenkins; and Rev. Donald L. Sharp. After being duly organized, it was motioned and seconded that the name of the church would be the Faith Tabernacle Baptist Church. The next order of business was that of electing a pastor which was done by a unanimous vote of Rev. Donald L. Sharp being elected as pastor. The first worship service was held on Sunday, October 4, 1964 at 6738 S. Cottage Grove, 2nd floor. During the first year, forty-seven members joined, of which fourteen were candidates for baptism. After five years of renting at 6738 S. Cottage Grove, it was determined that in order for the church to progress, a permanent location was necessary. Within months, a site was located at 8210 S. Cornell Avenue, which was the home of the Cornell Avenue Baptist Church. Because Faith Tabernacle did not have the necessary funds to purchase the building for the asking price, and Cornell Avenue Baptist Church was in the process of evaluating whether to move or remain in a racially changing community, a rental agreement was entered into between the two congregations. On Sunday, October 6, 1969, the Faith Tabernacle Baptist Church moved to 8210 S. Cornell Avenue. For 2 years the Cornell Avenue Baptist Church and the Faith Tabernacle Baptist Church held separate Sunday Schools and Sunday morning worship services. Eventually, an agreement was made to combine the two Sunday Schools and for three years there was one Sunday School while the congregations continued to hold separate worship services. Subsequently, the parsonage located at 8201 So. East End Avenue was purchased. Additionally, in 1969, Faith Tabernacle Baptist Church became the first African American church to affiliate with the Chicago Metropolitan Baptist Association (CMBA) and the Illinois Baptist State Association (IBSA). In 1974, the Cornell Avenue Baptist Church decided to sell and move to a different location. With a $75,000 loan from the Home Mission Board of the Southern Baptist Convention, Atlanta, Georgia, the Faith Tabernacle Baptist Church purchased the building and held its first worship service on Sunday, October 6, 1974 at 11:00 A.M. In 1976, Rev. Raynarldo Henderson, Staff Minister, conceived the idea of the Feeding, Assisting, Inspiring, Teaching, Healing (F.A.I.T.H.) Center. A ministry to provide both spiritual and physical nourishment. Each Wednesday at 11:30am, a Bible study and worship service are conducted, followed by a hot meal, and then each person is given an assorted bag of groceries for their home. On December 1, 1983, the church purchased the property located at 8201 S. Stony Island which was an old Amoco service station. Upon completion of renovation, it serves as the fellowship hall. In addition, two vacant lots were purchased--8212 S. Cornell (June 22, 1987) and 8201 S. Cornell Avenue (October 3, 1992) which was later sold and the proceeds used to purchase a bus. In 1995, the church launched a debt retirement campaign; by the end of the year retired its mortgage of $98,000.00. On Sunday, December 17, 1995, mortgage burning services were conducted with the message being delivered by the late Rev. Gordon Humphrey, Sr., Pastor of the Shiloh Baptist Church. 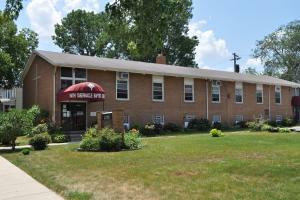 In an effort to offer affordable housing, the church purchased a 24 Unit apartment building located at 6100 S. Wabash. This event was covered in the Thursday, April 1992 edition of The Wall Street Journal, according to the staff reporter, Mr. Alex Kolowitz, author of the books, "There Are No Children Here" and "The Other Side of the River". In 1996, the church was able to partner with the Chicago Community Development Corporation (CCDC) and formed the Community Housing Partners L.P.. in order to acquire the necessary funding to renovate the 24 Unit apartment building. Loans and credits were obtained in the amount of 2.5M from the LaSalle National Bank, City of Chicago Department of Housing, Chicago Housing Authority, Chicago Equity Fund and the Chicago Community Loan Fund. The building was renovated and dedicated. In 1996, the church was awarded the prestigious Good Neighbor Award by the Chicago Realtors Association. During that same year, Chicago Magazine recognized Pastor Donald L. Sharp as one of six outstanding Chicago Citizens of the Year. In August, 2000, the church received a loan from the Chicago Community Development Corporation to purchase additional properties located at 8215-8245 So. Stony Island. Subsequently, after selling portions of this property the proceeds was used to retire the loan. .....AND HISTORY IS STILL BEING WRITTEN!